Looking to escape the hustle and bustle of LA? Escape to a coastal getaway in Santa Monica and Malibu. Here’s my guide on where to stay, eat and play. What I like about LA, is that it offers many different types of holiday, depending on what you’re after. If you are looking for a more coastal escape, I can recommend a stay/visit in Santa Monica or Malibu. Malibu Farm is an iconic eatery offering a restaurant and a more casual cafe, on the Malibu Pier. It’s one of those must-visit places for tourists and I adored the barn-like exterior and cosy Scandi-inspired interior. The food is simple yet tasty, and the views over the Pacific ocean cannot be beat. Another highlight of our trip was going on a Malibu Wine Safari. Now, wine and animals might seem to be a weird combination but it was so much fun! You get to explore the 1,000 acre Saddlerock Ranch and vineyard in Malibu, in a custom-built open-air Safari vehicle. You’ll make stops along the way to take in the scenery, taste six different wines, and get up close and personal with animals like zebras, camels, alpacas, bison, and even Stanley the Giraffe (who we got to feed on our tour – that’s my hand pictured below!). It’s an experience I’ll never forget. We didn’t stay overnight in Malibu, but if I was to re-visit I’d love to stay at The Surfrider Malibu. The interiors are dreamy, with a definite laid-back coastal vibe, but not in a cliche kind of way (no anchor motifs in sight here!). And that rooftop deck reserved just for guests, looks like the ideal spot to drink a glass of wine or two and watch the sun go down. If you’re looking to base yourself in Santa Monica, check-in to The Shore Hotel – a boutique hotel with a focus on eco-conscious practices. Situated right across the road from The Santa Monica Pier, and minutes within great shops and cafes, The Shore Hotel is the perfect place to base yourself. It’s also a 10 minute drive to Venice (shopping on Abbot Kinney Blvd is a must), and 30 minute drive to Malibu. The rooms whilst small, are comfortable, and ours had beach and pool views! Welcome drinks on arrival, and free cruiser bikes are just some of the perks. 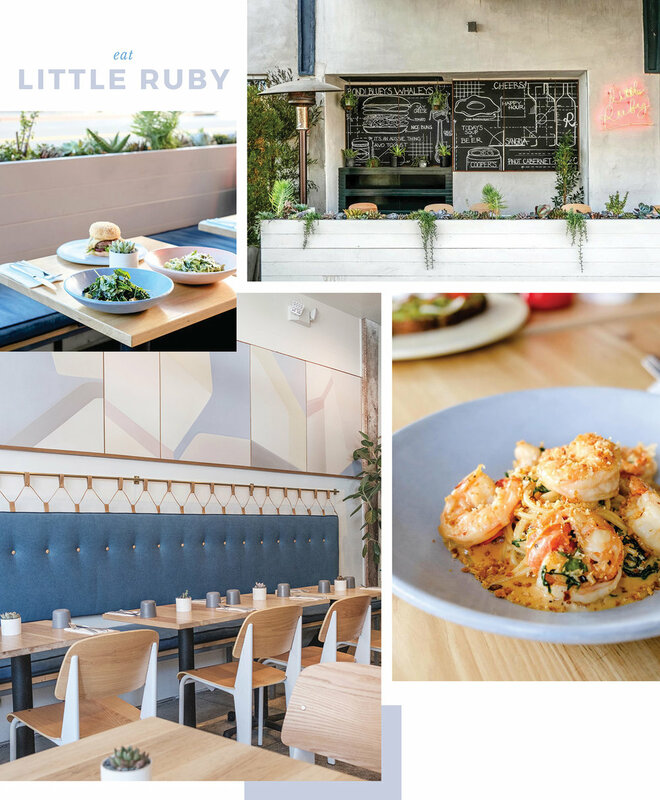 During our stay in Santa Monica we stumbled across this cute cafe – Little Ruby. When we were checking the menu out, we noticed they sold vegemite on toast, and thought hey this must be an Australian cafe! Naturally we went in, because we were in search of Aussie-style coffee, and Little Ruby did not disappoint. We loved this place so much we ate here for almost every meal, breakfast, lunch and dinner! Definitely include this place on your list if visiting Santa Monica. 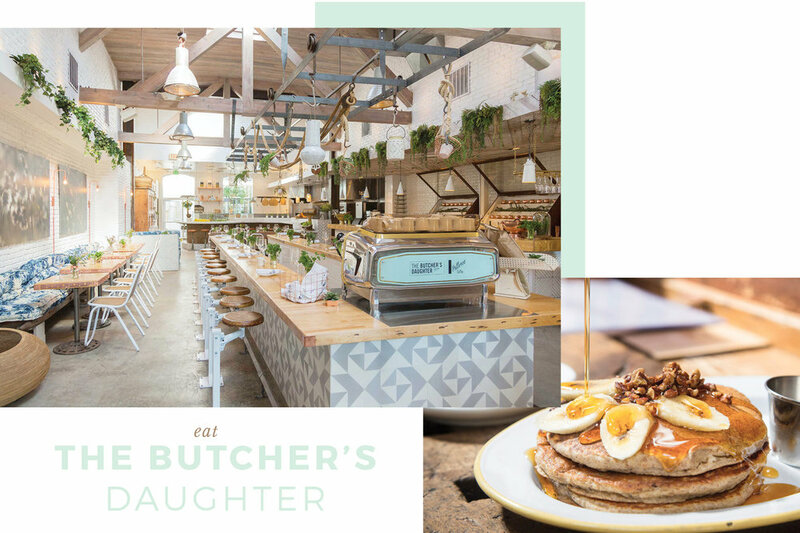 Unfortunately I didn’t get a chance to eat at The Butcher’s Daughter, but I so would have loved to. It’s located in Venice on Abbot Kinney Blvd, while you’re here explore the shops on this street – there’s so many great boutique stores (and it’s a very long street, just be prepared to allocate a few hours (and dollars) to spend here. I loved this part of Venice, it had a real sense of community here, and is much, much nicer than Venice Beach.